EDITOR’S NOTE: This post covers the 8-quart Ambiano 9-in-1 Pressure Cooker. You can read about the smaller 6-quart 6-in-1 Pressure Cooker here. Over the last few years, nothing has captured the attention of the home cooking world quite like Instant Pots. If a website covers food in any way, chances are that the site has not only has talked about them, but might even be collecting affiliate commissions for talking about them. Instant Pots are, to put it simply, modernized versions of an old-school device, the pressure cooker. Pressure cookers use pressure and steam to accelerate the cooking process, often producing excellent results. Where older pressure cookers require a bit of guesswork, modern Instant Pots reduce it to a programming science. Aldi has its own version of one. The Ambiano 9-in-1 Programmable Pressure Cooker, an ALDI Find (Special Buy), retails for $59.99, which is significantly less than Instant Pots of its class. This is actually the second Instant Pot clone Aldi has sold, the first being the $39.99 Ambiano 6-in-1 Programmable Pressure Cooker. In addition to the additional cost and number of modes, the 9-in-1 is also larger: it’s 8 quarts, in contrast to the 6-in-1’s 6-quart capacity. Nine program settings: steamer, keep warm, slow cook, rice cooker, cake maker, pressure cooker, sauté, yogurt maker, and canning. The warranty is serviced by Customer Care USA, which services the other Ambiano pressure cooker, as well as a a number of other Aldi appliances. Of particular note is the stainless steel cooking pot, which is different from the nonstick pot used by the Ambiano 6-in-1 Programmable Pressure Cooker. While different people may have different opinions as to which kind of pot is better, stainless steel is more consistent with an Instant Pot experience. The Ambiano pressure cooker is — like most electronic pressure cookers — a complex device, so you’ll want to spend some time getting the ins and outs from the manual before using it for the first time. Some of those steps relate to safety, which makes them especially important. These devices do have a learning curve, so spending some time reading things carefully the first time helps to make the experience better overall. Once properly set up, it’s pretty much just about setting the cooking setting, setting a cook time, and getting started. With all the pre-programmed modes, there are a ton of different ways to use this device, and the delayed start even allows for setting the Ambiano to begin its work while you’re gone. On the other hand, it can also keep things warm when cooking is done. We haven’t had a chance to go hands on with this model (yet), but we’re obviously intrigued, especially given how cheap it is compared to an Instant Pot of the same feature set. Granted, Instant Pots tend to have pretty positive reviews, but Aldi appliances have come a long way in recent years, so we’re optimistic about this one. We’d love to hear individual user experiences in the comments. I love my Ambiano 6-1 Pressure Cooker I got over a year ago, I’m glad they are upgrading it. This could be a tempting upgrade but a 8 quart is just a little too large for me. Is this pot lower pressure like the 6-in-1? I like that pot, but have an instant pot for higher pressure. I have and love two 7-in-1 Instant Pot DUOs, a 6 qt and a 3 qt. I picked up one of these Aldi pressure cookers on Wednesday, and did Instant Pot’s recommend water test (instructions are on Instant Pot’s website), to make sure it worked right without the risk of wasting food if it didn’t. That’s all I’ve done with it so far. There are a few minor differences, such as a button that you have to push to open the lid, a frame the sealing ring fits onto before placing in the lid, and I noticed in the description it says the keep warm temperature can be set for only 24 hours on this Ambiano pressure cooker, and up to 99 hours on the Instant Pot; other than that it seems to have the same functions, including the ability to choose high or low pressure. I like that has lid holder slots in the handles like the Instant Pot, though only one lid fin because of the lock button. I just took another look at the Ambiano’s manual, and it looks like you can’t adjust the temperature/heat setting when using it on “Saute” or “Slow Cook” like you can with the Instant Pot. Thank you for your replies, they help! I’m buying one today for sure! We bought the 8 qt 9 in 1 ambiano at Aldi’s the other day. We made the Beef stew tonight. It was so-o-o good! Even our picky 14 year old had seconds. The manual for this states 8.7psi operating pressure, low compared to Instant Pot, and the same as the 6qt Ambiano cookers sold earlier. I’m very curious whether this pressures up slowly and / or extra time needs to be added to the cook cycles due to such a low pressure. Other than that 8.7psi, the rest of the product’s features are stellar. I wonder why the PSI is only stated at 8.7, since this seems low. I have 2 other pressure cookers (Elite Brand) and they both cook at 12 psi. This also puts a concern using their canning feature on this, because that is about half of what is safe for canning. It should be okay for water bath canning, but I don’t know if it would work at all for pressure canning. I think most electric pressure cookers cook at 12 psi, so it may take longer to come to pressure and also longer to cook your food. This may be a miss for them to have a lower psi than other brands. Good catch on the lower PSI; I hadn’t noticed that! I use my Instant Pot pressure cookers as more of “set it and forget it” devices, so longer pressurizing time may not matter to me but I can see how it would to others. Needing longer cook time would change things; I’d have to compare cook time charts between this cooker and Instant Pot. It does state in the manual that it is to be use for only water-bath canning, not pressure canning. There is no electric pressure cooker that is safe to use for pressure canning. I got one and used it today. It was only sale for 39.99. First for hard boiling eggs just to see how it works. Then I did the stew recipe that came with it. 35 minutes plus warm up for stew seemed very worth trying. Came out good. I’ve never used one before, but I think this will be something that will be used regularly. It’s still $59.99 at all 3 of my local Aldi stores. I bought the 8 quart for $39.99 at our local Aldi last week, it was one of the last ones. Still figuring out how to use it as the valve didn’t pop up when I made hard boiled eggs. Only use as a water bath canner and to sterilize the utensils used for canning. I received one for Christmas. For “hard boiled” eggs, the cookbook said to set raise the time to 6 minutes on the egg setting. I left it at 5 and it was just a little runny in the very middle, just the way I like it. The biggest drawback to me is that the manual unfortunately, does not have cooking time charts for items other than the presets. Next up was sweet potatoes which is not in the manual or cookbook. So I looked up the Instant Pot directions which said 15 for large potatoes. Considering that the psi for the Ambiano is lower than Instant Pot (thanks Lisa I didn’t realize this) and these were very fat potatoes, I cooked for 20 and they were still a little hard in the middle. Steamed frozen vegetables for 2 minutes and let sit for about 5 more and that worked perfectly. This morning steel cut oats ratio of 4 cups water to 2 cups oats (I guessed) and it was a little too runny. I left it on the oatmeal setting which apparently is 15 minutes then I forgot about it and it sat 20 minutes after. The steel cut oats were cooked well but this seems way too long for regular old fashioned oats. Using my 9-in-1 for the first time. My question is about the float valve which is supposed to pop up and lock the lid according to the manual. Nothing pops up, it’s just a hole with the red piece sitting inside. Is this normal? Help please! the little red piece will pop up as the pressure in the pot increases and then will hold the pressure in as it increases to the working pressure. I takes a while. Not sure how long you waited. I am having the same problem can someone explain. Have been using my Ambiano 9in 1 for several days now. Have been very pleased with the performance. It appears to be the same or nearly the same as the IP Duo 9 in 1. The buttons may be in different places, and as someone mentioned earlier, the red float button doesn’t come all the way to the top, but I have noted when the pot comes up to steam pressure, the hissing noise stops and the countdown begins according to the recipe. I purchased an IP authorized cookbook ,The Essential Instant Pit Cookbook, by Coco Morante at Target for the IP (30% off). Great deal! Packed with tips/useful advice and great recipes. Best purchases! I have been using my Ambiano 9 in 1 for several days now and have not been disappointed. Like many of you, I was hoping it would turn out to be a great purchase, and it has been. I’ve made oatmeal, boiled eggs, Mexican chicken burrito, butternut squash, and after Christmas ,even bought an authorized by IP cookbook at Target. The book, The Essential Instant Pot Cookbook , by Coco Morante was 30% off, another great purchase. She gives extremely useful information, which is easy to follow. Have made chickpeas from dried, Indian simmer sauce, to make the Chana Masala, which is delicious. I made humus from the rest of the 1 pound chickpeas. Cannot wait to cook my way through it. She has included charts galore throughout, and I appreciate that. She even walks you through the process of converting some regular recipes into pressure pot recipes.” The Ambiano 9 in 1 appears to be almost the same as the IP Duo Plus. The buttons are in different places, but they all function as labeled. I don’t know her, do not own the Instant Pot brand pressure cooker, but am so happy to have stumbled upon the cookbook and the Aldi Ambiano 9 in 1. Score!!! I have searched to buy another one. I purchased one to see how it would work. My DD kept it and I want one. Actually, I would like to have two if anyone knows where any are available. I have cooked with a pressure cooker for years and I loved this! Just fyi, if you can’t get the Ambiano, you can get 2 of the TriStar 8qt Power Quick Pots from powerquickpot.com for $130 maybe plus state tax. They have sous vide, which the Alldi cooker doesn’t offer. Only a short 60 day warranty but extended warranty is available for purchase. The operating pressure is definitely on par with the Instant Pots. I passed the Aldi 8qt by and got a Power Quick Pot from a local liquidator that gets store returns. It is brand new and hadn’t been cooking in, and cost less than the $60 that Aldi wanted for their 8qt. IP 8qt gaskets fit the Power Quick Pot. It is also available in 6qt and 10qt. Does anyone know what is the low pressure on this? This is why having a cooker running only 8.7 psi on high pressure is not great. But Aldi keeps the prices down by cutting corners. I am happier with my Power Quick Pot. And Farberware. Both 8qt. It seems that they produce good quality items and I have grown to trust what they sell. No way would I have gotten a pot like this due to the price by other manufacturers. Im pleased and am learning a bit more about them. Still quicker than other methods. I ve been cooking a meal a week with it. A Mississippi roast in just a bit. Hi, the high pressure is 7 psi, the low is 4 psi. I called the ambiano number for this info. The manual says the high working pressure is 8.7but does not give the low that I’ve seen. I saw a review on the Kitchn Blog about the Ambiano 9 in 1 8 Qt which recommended to snap it up if I saw it in my Aldi store. So I did so right before Christmas and I’ve been easing into it. I have never used an Instant Pot, so I can’t compare them, but I’ve made ham in it and baby back ribs that both turned out amazing. Sooo good! I was surprised how easy it is to use because I’ve always been intimidated by pressure cookers. 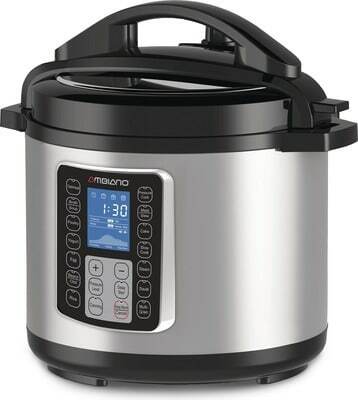 I absolutely LOVE it so far and it was such a great deal compared to the price of the Instant Pot. I don’t mind having to add a few minutes to cooking times when converting Instant Pot recipes. It still cooks incredibly fast and leaves meats so juicy! I’m a pressure cooker convert now! I bought one the other day at Aldi, they had it on clearance for $24.99,!! so I figured what the heck. I have only made oatmeal so far but that turned out really good and only took about 10 minutes . The 8 quart was only $24.99???? Or was it the 6 qt? My local Aldi is closing for remodelling for 3 months, so I managed to get my 8qt 9in1 for $21.50! These deals do exist, but it is pretty much luck. I just bought the 9 in 1 programmable one from my Aldis for $39.99. I spent 2 hours trying to get it to pressurize and it never would. What am I doing wrong? What Steve said, plus gasket correctly intstalled. And float or bobber valve correctly installed. Do a ”water test”: Put in 1.5 cups water only, close it up, and select any pressure cooking cycle. Run it on pressure cook for 5-10 minutes to see if it heats and holds pressure. That will tell whether the cooker works. Soups and large pieces of frozen meat take a long time to pressure up. Instant Pot says up to 35 minutes, I think. This machine is underpowered compared to IP and is going to take even longer! One tip that I use is turning on “saute” so that the pot is warming up while I’m getting the dish prepared. It pressures up quicker if you preheat it. So far I’ve also made sure that my ingredients are not frozen. But I realize that isn’t always convenient. Also, I have found that heating whatever you use for fluid in the microwave cuts down the time considerably. I got mine for Christmas from Santa. I have not used it yet as I want to make sure I know what I am doing. But there IS a problem with the rubber feet I assume because it does not sit level on the countertop. So I am concerned. I agree with others that a simple grid type list of foods with amounts to add (both minimum as n max) with cooking times would be helpful. And MORE recipes to give you ideas of things to make would this much better. I called the contact number to order another silicone washer and gasket for my new 8 qt. Ambiano pressure cooker from Aldi and they told me that they didn’t have any parts for the new 8 qt. pressure cooker. I checked at several stores and Amazon but couldn’t find anything for the silicone washer. There were several rings that might fit but no washer. What now? If I need one it is not available, even from Tempo International Fulfillment who had it made in China. I’m keeping the cooker as the price was great and everything else seems to be also. Just the fact I can’t get a replacement washer is a concern though. If anyone else finds one please let us know. Thanks. That’s odd. I called Tempo about 3 weeks ago and ordered on and got it within about 10 days. It came from Great Britain. Im interested in getting the way you contacted them if you could share that. Can you share how you contacted them, please? Told them what I wanted and gave their the model #. It cost $15 and was shipped the next day. I just found the answer. Manual says it stays at 190 to 208 F. That would be a low setting. Would be nice to know what the temp ranges of saute and warm are. 3 year warranty on pot so might as well have an extra seal. I HAVE BROUGHT ALONG WITH MY DAUGHTER AND A FRIEND A TOTAL OF 5 AMBIANO 8 QT 9IN1 PRESSURE COOKERS. ON ALL OF THEM BROUGHT AT DIFFERENT STORES ARE DEFLECTIVE PER MY CALL TO 1-866-235-5029 WHERE THE CAKE MODE DOES NOT HAVE A LOW PRESSURE SETTING (IT DOES NOT INDICATE ANYTHING ON THE SCREEN) ASKED THEM WHAT IS IT SET AT? THEY HAVE NO IDEA. THEY REFFERRED ME TO THIS WEB SITE TO GET ANSWERS ON OPERATING PRESSURES/TEMPERATURES. THE TROUBLE IS “[email protected]” AND “[email protected]” CANNOT BE USED. CANNOT CONNECT TO THEM. AND THE PEOPLE AT 866-235-5029 ONLY READ YOU THE MANUAL. I RECALLED THEM 2 DAYS LATER AND THEY TOLD ME THAT THEY ARE DEFECTIVE AND TO RETURN THEM. SO WE ARE RETURNING ALL 5 . MY THE WAY, I TRIED TO USE THE PRESSURE/TEMPERATURE SETTINGS TO MAKE THE CHEESECAKE AND THE BANANA BREAD AT LOW PRESSURES. THEY BOTH WERE UNDER COOKED AND VERY SOFT. I HAVE A 8 QT INSTANT POT DUO 80 FOR OVER 2 YEARS AND IT WORKS GREAT. wow.no problems with mine at all, so far. Hi. I run an Instant Pot group for beginners on Facebook. One of our members has the 9-in-1. She said she put the lid on backwards and now can’t get it off. It was empty. Anyone know if this is possible to do and if so, can she get it off? I bought the 8 quart on sale for $39.99 and absolutely love it. I’ve cooked in it nearly every day for the last 3 weeks and it has performed marvelously. I’ve never owned an IP so can’t speak to comparisons, but I’ve used IP recipes almost exclusively in it and have had zero problems. I’m looking to purchase a pressure cooker I am debating on the Aroma Professional Plus or the Ambiano 9 in 1 … I need something to prepare different vegan meals. Which is best ????? Inquire minds want to know…. You can only buy Ambiano at Aldi at specific times, unless you are looking at secondhand ones. Aldi offered this essentially for the 2018 Thanksgiving/Christmas season. Aroma, I would not buy. Instant Pot Magic Chef, Power Quick Pot, and if you don’t need low pressure, Farberware: Those are my favorites. The PQP only has 6 month warranty unless you buy an extended warranty. If yogurt is important, read the manual and see if the yogurt program can do cold start. Farberware has no Yogurt because lacks low pressure. The PQP, Yogurt is boil method. Magic Chef, Yogurt is just the incubation phase and you use something else for pasturization first. Instant Pot Duo is a best seller because it’s well designed. Study before buying any pressure cooker. Ambiano 8-qt was last week’s special, at least in NE U.S.A. So there are probably still some on shelves now. Wow. Totally different sales flier here. No pressure cooker since before Christmas. I just bought this Aldi’s Insta Pot last week. Made hard boiled eggs that came out great. I know hard boiled eggs? But they did peeled better and it was a good first test. Then I tried the rice Pudding recipe in the book that came with it. It was ok. Not like the picture. Then I made the Jasmin rice with a pork tenderloin in it. It came out ok. Just learning right? But one thing I noticed right away was this.t The inside of the stainless steel pot scratched really easily using a metal spoon to get the food out go the pot. I have a set of Revere Ware that I’ve had for 35 plus years that has with stood the test of time better than this pot. Time will tell how it holds up. Has anyone used it as a slow cooker? I have a recipe that says 3 hours on high or 6 on low. Since this has only one setting I wonder if it is as high as other slow cookers are.